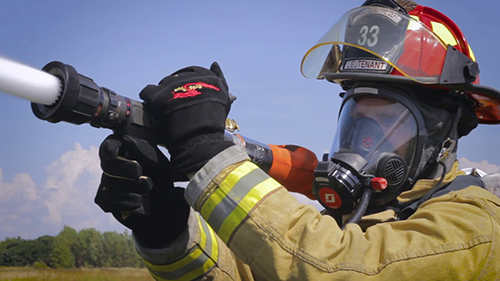 Detroit’s Lightweight Innovations for Tomorrow (LIFT) Thursday announced it helped Lansing’s Lifeline Firehose produce technology that allows a firehose to deliver both breathable air and water or foam simultaneously. The technology is being launched on a Grand Ledge Area Fire Dept. truck in Grand Ledge (west of Lansing), allowing firefighters to battle fires longer and get air to downed personnel and victims. A coupler system delivers both air and fire suppressants to the end of the nozzle, allowing for the simultaneous flow of air and water or foam through a double-jacketed fire hose system. It also allows the air and water or foam to be sealed separately, eliminating the chance of cross contamination. The system attaches to equipment firefighters already use and are trained on. “It has been quite rewarding to help Lifeline Firehose bring this vitally important technology to the firefighting community to help those dedicated men and women do their job more safely and efficiently,” says Nigel Francis, CEO and executive director of LIFT. The system includes an air cart, which can be portable or permanently installed on a fire engine. LIFT, a public-private partnership dedicated to developing and deploying advanced lightweight metal manufacturing technologies, as well as implementing education and training programs, is operated by the American Lightweight Materials Manufacturing Innovation Institute and one of the founding Manufacturing USA institutes. Located along Rosa Parks Blvd. in Corktown (south of Michigan Ave.), the facility is funded in part by the Department of Defense with management through the Office of Naval Research.